I learned something by accident with this card. I decided to heat emboss the image and sentiments (liquid platinum for the first card, white for the second). My heat tool is very hot ... it's not a crafting heat tool, it's something I "borrowed" from my hubby's workshop and have kept for the past five years. :) It's meant to strip paint, so it's pretty hot. Anyways, the watercolour changed colour when it was heated. The red turned darker and almost purple in spots. Still happy with the look, but not as bright as before the heating. I was inspired to make this card after seeing this beauty by my very talented friend Maria (reislingmama). After doing my wash, and then looking at my new stamps, I thought of Maria' gorgeous card so this became a CASE. :) Thanks for the inspiration Maria!! More watercolouring to do and I'll be back tomorrow with more to share with you. Thanks for taking the time to visit. I'm with you on this stamp Loll, it is so so pretty. I will have to add it to my need, must have list. Your watercolouring have made the stamped image even more beautiful. Love both these cards. Your wash is perfect for this stamp, Loll! And what a wonderful sentiment! Loll, you have a talent for taking a stamp and turning it into a work of art! Each time I see one of your creations I have an urge to go shopping! Beautifully done and the watercolor works so perfectly with this beautiful stamp and sentiment! Your wash is perfect--and just right for this lovely stamp and sentiment! (my wash was a fail....) Gorgeous card! Your watercoloring is perfect, and the stamps are wonderful! Wonderful water coloring and both designs are fabulous. Beautiful stamp and sentiment on your gorgeous background. Love your card. What perfect colours for that stamp - and I love both sentiments. Two lovely cards from your watercolour wash! your cards are just wonderful. I love the perfect background, beautiful color gradation. Gold embossing makes the card is extremely elegant. Beautiful watercolour washes, Loll! I find that heat, even from a 'normal' heat gun, changes the colour, usually making it duller and less vibrant, especially with distress inks. Thanks for your help over the delicata ink ..... your card looked so gorgeous that I just HAD to have some! Gorgeous Loll... and it gladdens my heart to see that even someone as awesome as you occasionally CASE's cards! 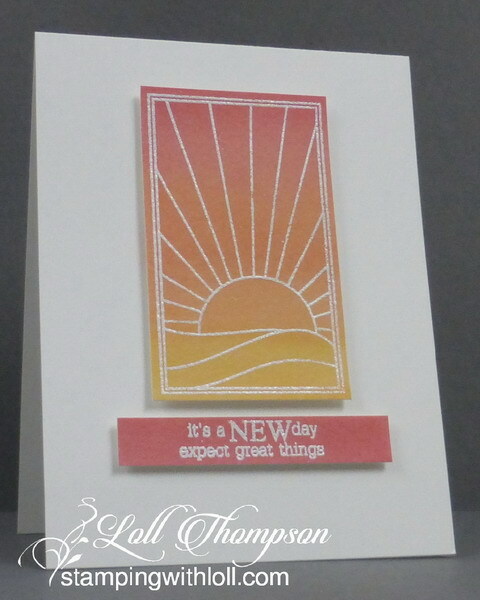 Oooh - these are just gorgeous Loll and the beautiful sunset watercolour background is perfect for the image. Two really gorgeous cards, Loll! I love the softness of the colors...they're perfect with Dee's new stamp set...WOW! That stamp is the perfect way to show off your watercolor wash, Loll. I don't know why I skipped this in practice. It has to be easier than the things I'm trying to do.